Well, today was spent prepping paper for gum and gum-over-platinum printing. I did two batches of 10 sheets of 11×15 Rives BFK. 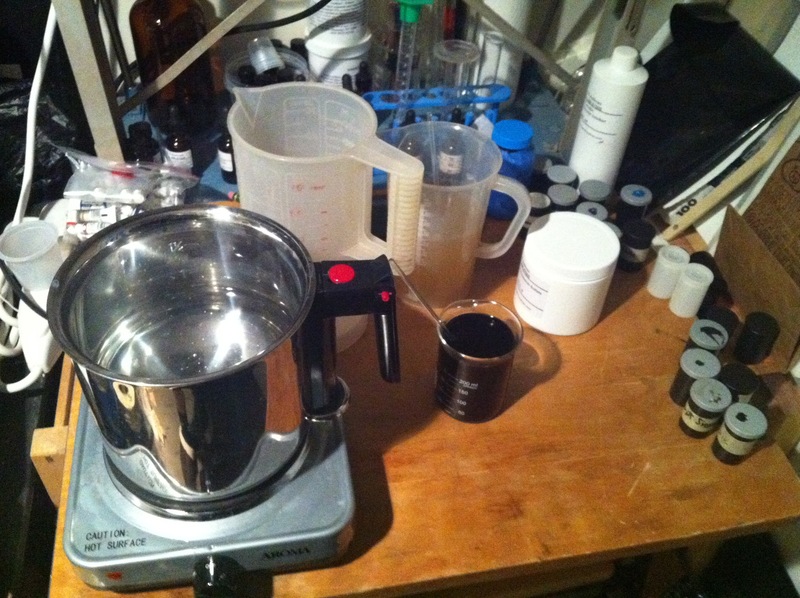 The first batch had an oxalic acid pre-bath. The last time I used Rives BFK for a platinum/palladium print, I got these funny discolored blotches, which could be attributable to paper pH, so I’m trying the acid pre-bath to see if that makes a difference. 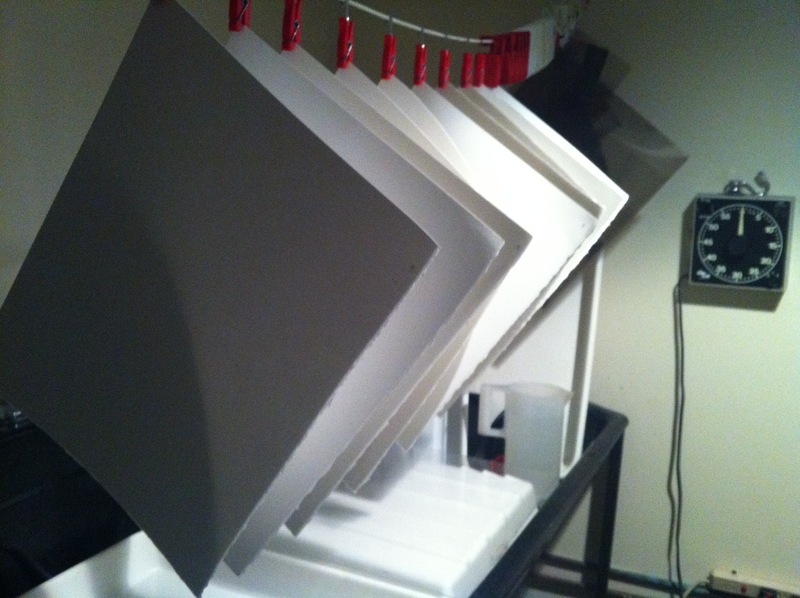 Twenty sheets doesn’t sound like a lot, until you realize that I can really only size paper in 10 sheet batches because that’s about all my clothes-drying line in my darkroom can handle. In any case, it’s enough to get me printing for a few weekends, so I won’t have to do it again for a while. It’s a necessary evil in the gum printing process, because without it your gum image would dissolve off the paper in the development step. Sizing is an interesting creature – basically it’s Knox unflavored gelatin with a hardening agent added. 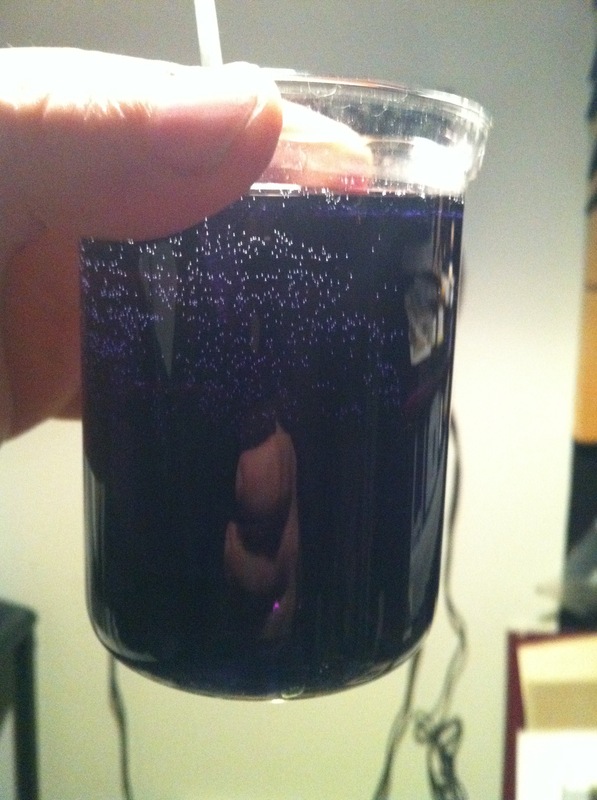 To make it, you put a box of four 7 gram packets in 300 cc’s of cold distilled water, let the gelatin bloom for 30 minutes give or take, then mix the bloomed solution with enough water to bring it to 1 liter. Place this new solution in a water bath and heat until the gelatin solution reaches 140 degrees Farenheit. Add your hardener, mix, then you’re ready to coat. I have a bain marie pot that I use on a hotplate for heating the gelatin so it doesn’t scorch, and I can do it in my darkroom instead of on the kitchen sink. Sizing needs a hardening agent to help it stand up to repeated soakings in water. Hardeners are all something other than pleasant chemicals – typical hardeners are Chrome alum, Glyoxal and Formaldehyde (Formalin), in ascending order of toxicity. This time I decided to give the chrome alum a try because it doesn’t off-gas, has minimal effects from exposure, and requires the least safety gear for handling (latex gloves are sufficient). I had been using Glyoxal before, which requires good ventilation. My darkroom has minimal ventilation, and at this time of year, fresh air comes with a massive temperature penalty. Formalin pretty much HAS to be used outdoors, so that’s not happening either.